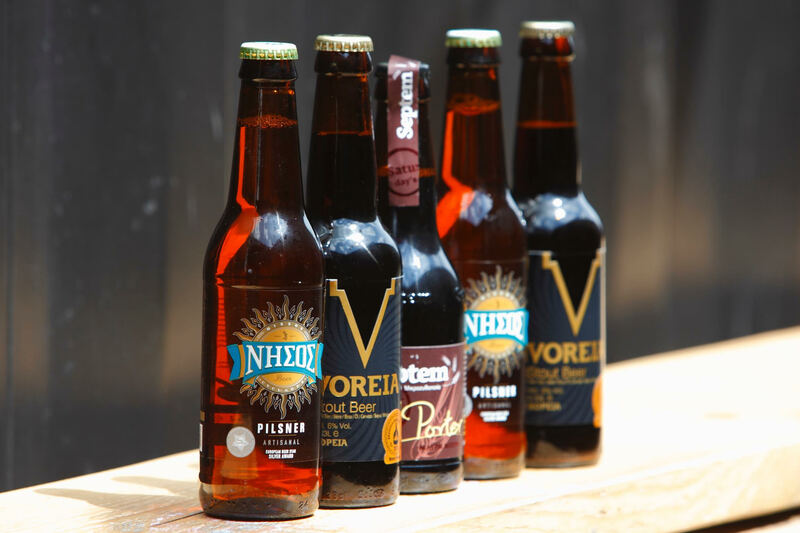 Efthymios and Neofytos and their amazing ''The Athenian'' project. Hi guys! Tell us a bit about the both of you. -Hello! We are Efthymios from Athens and Neofytos from Limassol! 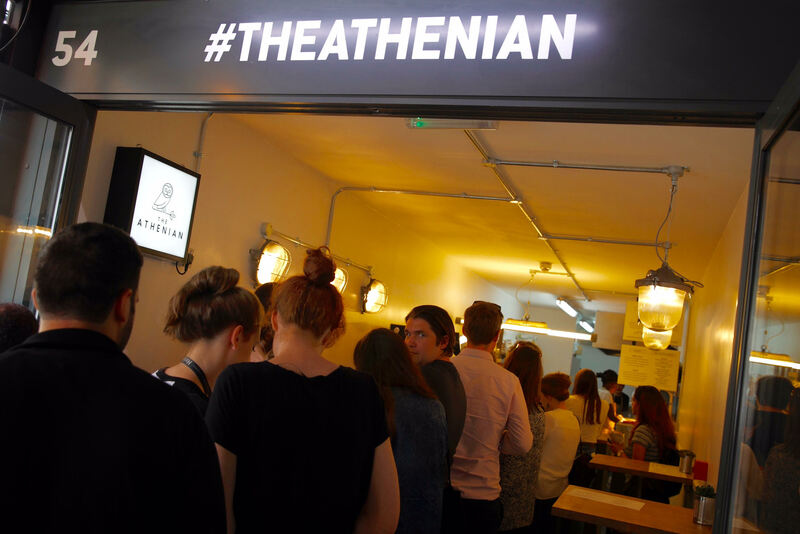 We have launched a small street food company based in London called The Athenian, which brings souvlaki as it's made back in Athens to the streets of London! -Efthymios - The Athenian started at the end of 2014. After many years of frustration towards the Greek food options in London, alongside a never ending craving for delicious souvlaki, I decided to just go for it and make my own souvlaki on the streets of London! 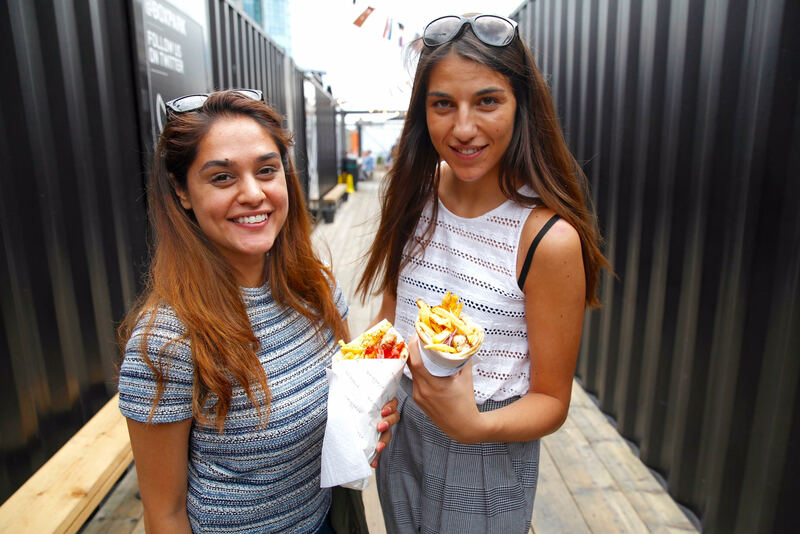 It all started at a small market in London once a week but very quickly the demand for our homemade souvlaki made it a round the clock operation! In the early days it was just myself with the help of some kind friends! In April 2015 I heard about the opening of a Greek stall that was doing loukoumades down the road from where my stall was so I went to check it out and try the food! There I met Neofytos and shortly after that we decided to do a joint pop up on a Saturday in order to make souvlaki and loukoumades on the street! 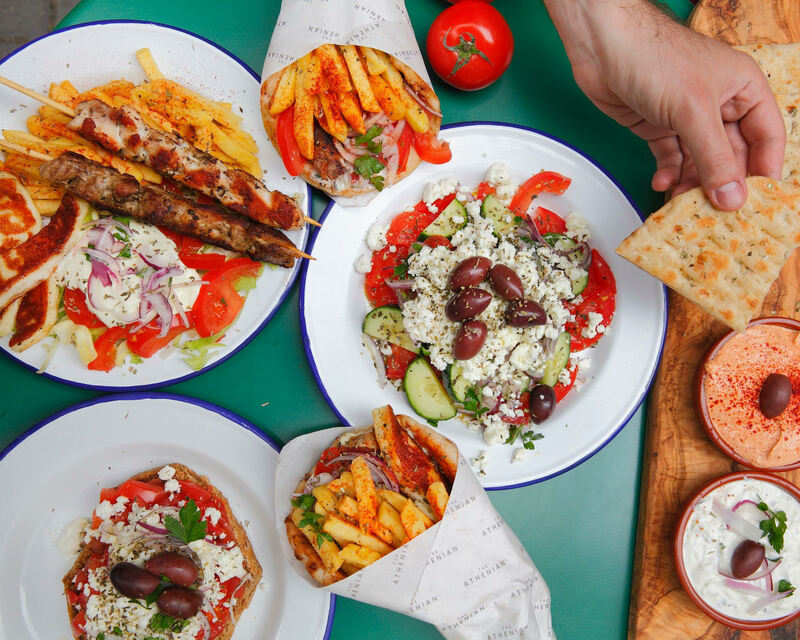 That went really went and we decided to partner up and focus on souvlaki! -Efthymios - I visited Crete in the Summer of 2013 and stayed at the small inland village of Vamos which is where I met an older lady, Mrs Koula. Mrs Koula lived in Canada for 20 years before she decided to finally move back to her home town in Crete. The people of Crete are so warm and friendly which makes it easy to strike a conversation so I ended up at Mrs Koulas kitchen where our mutual love for food brought us together! That's where she showed me her own recipes on how to make traditional Greek dishes like fasolakia (green beans), dolmadakia, dakos and a local speciality called kalitsounia which was so delicious I'm still craving it to this day! I think my experience with Mrs Koula captured everything I love about our food culture in Greece: delicious, natural and uncomplicated food bringing people together. And I really wanted to bring that back to London with me, so that's when the spark for the Athenian was born. 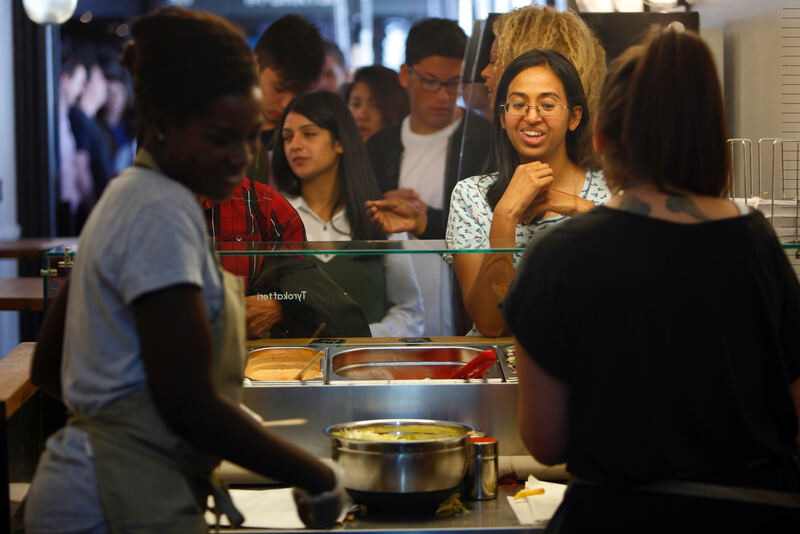 -Neofytos: Well before the loukoumades and The Athenian I was fascinated by the street food markets of London; the offerings, the stories and the journey of the different vendors. I could see some other cuisines like Mexican or Italian taking off but not the Greek, which is my favorite cuisine. Back then it seemed easier to start with loukoumades, something I love, missed eating and relatively easy to make out on the street but still a novelty for Londoners! 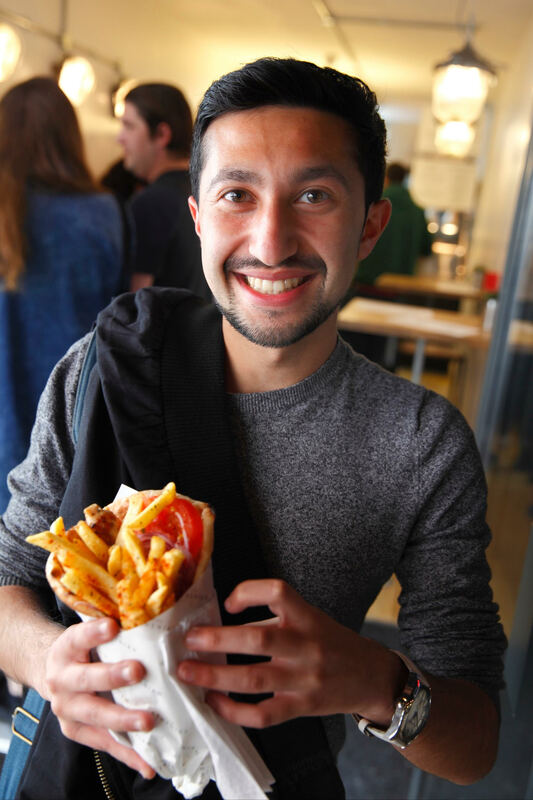 It so happened that at the time, Efthymios was doing souvlaki just down the road, we met to combine forces for a Greek street food pop up and we have been running The Athenian together since then! What is it like to have a big career change? -Efthymios - The change was pretty significant for me. I used to be a sound designer and engineer for Video Games, which has nothing whatsoever to do with food! I always had a really special relationship with food - mainly consuming it - but after a certain point, the lack of homemade Greek food in London really pushed me into a new direction. So I started cooking everything Greek on a weekly basis, from moussaka, to yiouvetsi and spinach pie with handmade dough! I didn't stop there though, I explored Asian cuisines too including Thai and Japanese which are two of my favourites! 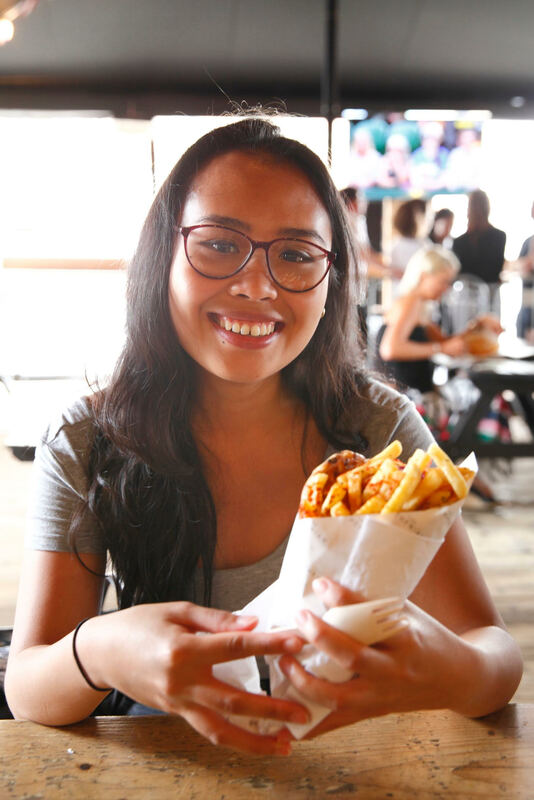 My daily life changed dramatically when I started with street food. I had to buy a van, learn how to drive on the opposite side (for me at the time) of the road and I would honestly compare it to having a child! You can never truly relax once you have it! You're always thinking about it or working to improve it one way or another without even realising! -Neofytos - It is not actually the first time I changed a career path. I started my career in investment banking but after 5 years I realized it wasn’t for me, I moved to west Africa for 5 months where I worked with a social enterprise and then travelled in the region. Once back in London, among others I was working with small businesses helping them to scale up, that’s how I realized I wanted to setup my own thing! To be honest, I then underestimated the workload of running a business and the toll on someone’s personal life. It was a massive change, going from an office job to driving a van, setting up and grilling out in the rain a lot of the times, and then coming back home to coordinate for the next day, supplies, events, marketing etc. Friends and family won’t get it at the beginning; Efthymios and I were also very determined to get this right seizing any opportunity was coming. Having said that I wouldn’t have done differently now. It has been an incredible year, learnt so much about business, people and myself! How did you manage to grow in such a short time? - Efthymios - The recipe is simple. No sleep, no holidays, no personal life! Ok I admit, it sounds extreme but we both had to make big sacrifices to get to where we are now. It's not an easy game and it's certainly not for everyone, you really need to have a fire in you to keep going. -Neofytos – I would agree with Efthymios, as I mentioned above we basically gave up our personal life, I think it’s normal with any startup. Everything has happened organically. When it’s your baby, it’s hard to let go, we both wanted everything to be perfect! I have to say though we have been lucky, Efthymios and I shared the same vision for The Athenian but we also complement each other in terms of what we bring on the table. How do people respond to your food? -Our customers overwhelmingly love our food. 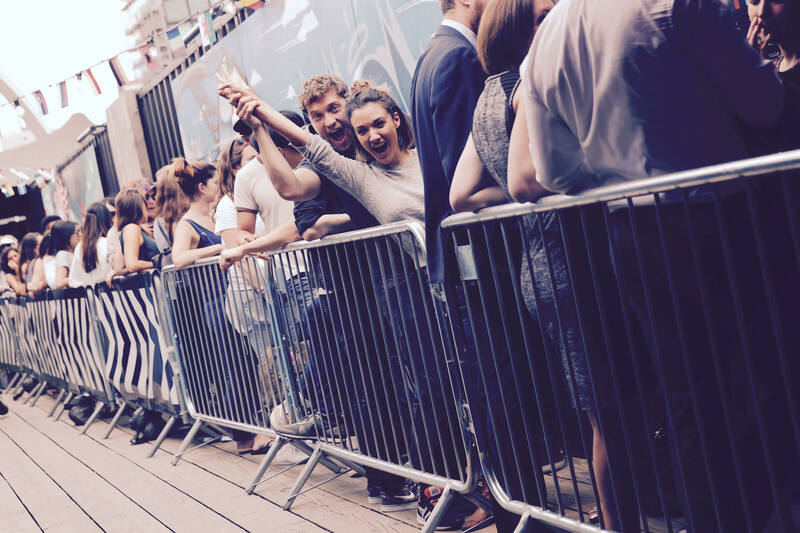 We have a big following on social media and a lot of regular customers who we know by name! People love Greece and most of them have either visited or really want to visit in the future. Would you consider returning to Greece or do you want to stay in London in the long run? -Efthymios - I would yes! I know Greece is not in the best of times financially at the moment. However it's always been a place that is full of energy, incredible scenery, beautiful nature, friendly people and amazing food. I visited Cuba earlier this year and I loved the culture of casas that they have there. As hotels are scarce, most visitors stay with locals in their homes which in Spanish are called casas. There, the host looks after their guests, cooks homemade meals for them, gives them travel tips and makes them feel like part of their own family. I can really see a lot of similarities with Greek culture and would love to take that one day into a new hospitality concept at a village or island in Greece. But I think that's a long way away! -Neofytos - Coming from a small place like Limassol, I always looked up to Athens and the opportunities of a big city. I love Greece, mainland and the islands, so beautiful in a different way. I was meant to go to Athens for university, all of my family did so and it was kind the natural choice growing up, however I got a very good offer to study in the United Kingdom. I would definitely want to spend more time in Greece in the future. Which is your most popular dish and what was the best compliment you had from a customer? -Efthymios - Our most popular dish is the chicken and talagani souvlaki. People in the UK go crazy for halloumi and talagani took this to the next level! The most memorable reaction was that of one of our Italian customers! Italians absolutely adore Greek food. So one Sunday on Brick Lane Market, we had an Italian guy ordering a souvlaki. Ten minutes later he runs back to tell us this was the best Streetfood he's ever had in his life and to order another 2. All I can say is I was so happy I almost cried! Did you face any difficulties or has it been an easy ride? -Difficulties? What's that? Never heard of it! Back to reality, we constantly face new challenges, some big and some small of all sorts. What's important is that we're learning and we're adapting. This has definitely been the hardest thing we've ever done in our entire life! What's driving The Athenian to where it is now? -A never ending desire to create change, both to the food scene in the UK but also to the image of modern day Greece. As we all know, growing up in a Greek home means that you learn to eat well - if not overeat at times! We all had moments with grandmas, aunties and mums cooking a "snack" or a "small plate" and ended up having a feast. I think our food culture is what makes us different. Two years ago we visited Naxos with friends. We sat down at a taverna, ordered food and at the end they brought us 5 litres of white wine, fruit salads and desserts for free! This generosity is what makes Greek culture so special and it's one of the aspects of Greece that we're trying to bring to the UK. What's the thing that you like the most about souvlaki? -There are a lot of dishes around the world similar to a souvlaki. And a lot of these you can find in London. But it's always the same feeling after eating them, they're just not a souvlaki! What makes souvlaki so unique is the combination of the bread, with the way the meat is marinated, the fresh salad, the amazing Greek yogurt and the fries. And the fact that it's all wrapped up together means that you can have a combination of flavours all in one bite! Is Athens taking over London? -Definitely! We always thought that Athens is one of the coolest and most lively capitals in Europe. We love the graffiti, artwork and cafe culture around the centre and this is something you see more and more of in London and other cities around the world. And of course The Athenian souvlaki helps to bring that feel of Athens in the most international capital in the world. Any plans to bring The Athenian to Athens? -Always! We love visiting Athens on a regular basis, we always have a great time and there's so much to do! From a stroll at the beach, to beautiful bars with views of the Parthenon, to the weather and the food! In terms of business, it is not in our immediate plans to bring The Athenian to Athens. Souvlaki in Athens and the rest of Greece is a really saturated market therefore we think it wouldn't be a good idea for us to open something at this point in time. We'll be visiting Athens later this year though and we cannot wait!